Pakistani salwar kameez is such a rage these days. Extremely comfortable and trendy, women have been flaunting all sorts of styles, a loose, long kurta with droopy sleeves having deep side slits worn along with a plazo, plain tight bottom, capri or pants. Fashion is definitely rolling for us ladies but so is beauty! To achieve that perfect look, we stress too much upon our lip color and eyes but what gives our entire appearance a complete makeover is the hairstyle we wear. With these droopily and loose suit tops, we usually opt for open hair. Since, each Pakistani suit is unique and has some sort of a embroidery and pattern at the back, hence becomes imperative to sport that as well. Isn’t it? Therefore, Zuri has compiled 15 awesome hairstyles to go with the ever stylish Pakistani salwar kameez. Braids & Buns: Grace your outfit with a braid done sideways, French, Dutch or Fishtail style. You can also give yourself a chic look by wrapping the braid into a bun. If getting dressed up for a special occasion, in that case, definitely go in for a traditional bun. It looks ethnic and also highlights the maang tikka, jhoomar, flowers or any other head accessory that you might have planned to adorn your hair with. Ponytails & Bohemian style: Feeling stylish? Try a puffed ponytail parted sideways or go for a side bun or a Spanish updo if your back is heavily embellished. These days, bohemian hairstyle is also pretty popular. All you got to do to make it look extra quirky is wear a hair accessory like a band or wear a floral head gear. 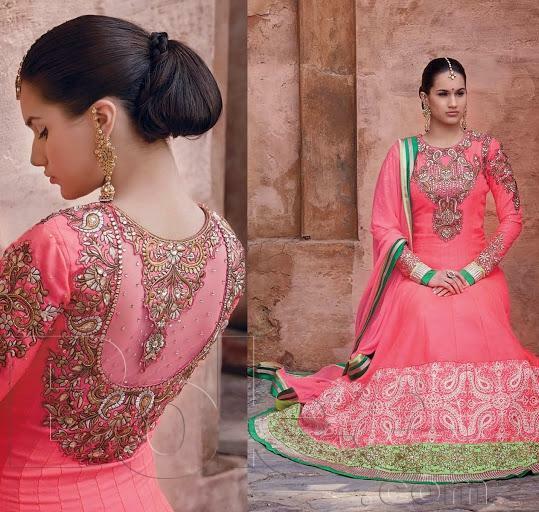 If your salwar kameez is light in color and has very little work on it, then wear your hair rough. Better still, opt for a messy bun. Curl your locks as curl bangs and it will look so classy. Open hair: Want to play safe? Go with waves. Leave your hair loose and spray on some styling serum for that extra smooth volume or you can go for a casual look, which is, side-swept open hair. You can also tie them up sideways or show off curls left loose at the end. Don’t forget to wear big dangling or jhumkis. Want to play safer? Keep your hair straight but gelled. Middle line parting is much in vogue these days so you can wear your straight hair parted midway. If you don’t have much time, then Zuri recommends opting for a half pinned up hairstyle which is also evergreen. Just pin your hair into a small puff and wear your smile. Next time you decide to wear your favourite Pakistani salwar kameez, just do remember to style your hair nice and pretty. A good hairstyle can do so much good to your overall look and personality.